1 The Front Elevation Of The Hall. 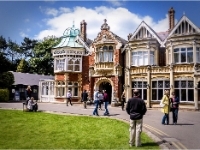 The front of Bletchley Hall as it is today. 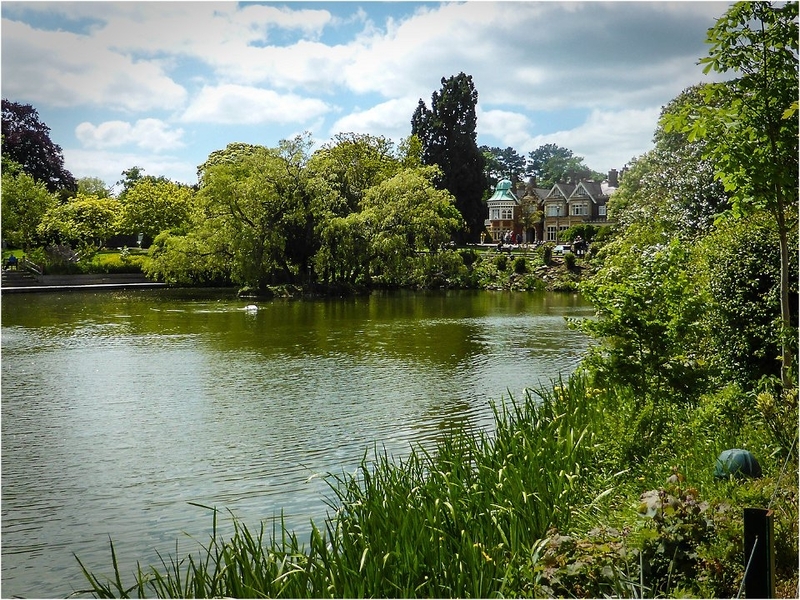 2 Bletchley Hall Across The Lake. The Hall (otherwise known as 'The Mansion') was built in the 1870s and was bought by Sir Herbert Leon, a wealthy stockbroker in 1883. In 1938 the British Government bought part of Bletchley Park, including the Hall to house the newly formed Government Code and Cypher School (GC & CS), which finally moved in in August 1939. 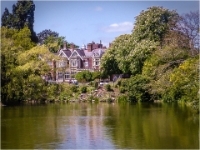 3 (A) Block From Across The Lake. Blocks A and B were meant to house all three sections of intelligence teams, Naval, Air and Army but in 1943 the Naval section had taken over all the buildings. The Blocks were bomb-proofed and shrouded by trees to break up the shadows that they might produce. 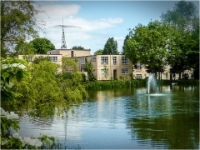 4 View Of The Hall Over The Lake. 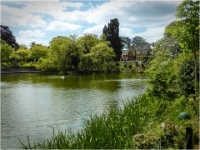 A further view of the Hall across the lake. 5 Time To Relax On The Tennis Court. Tennis was played on the lawns as a form of relaxation and it gave the nonsmokers a chance to purge their lungs. 6 A Senior Officer's Desk. 7 The Library. 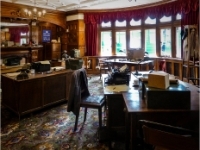 This is a view inside the library as it would have looked during World War Two. 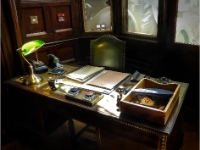 The air would have been filled with fumes from pipe smoking which was a popular habit at the time. 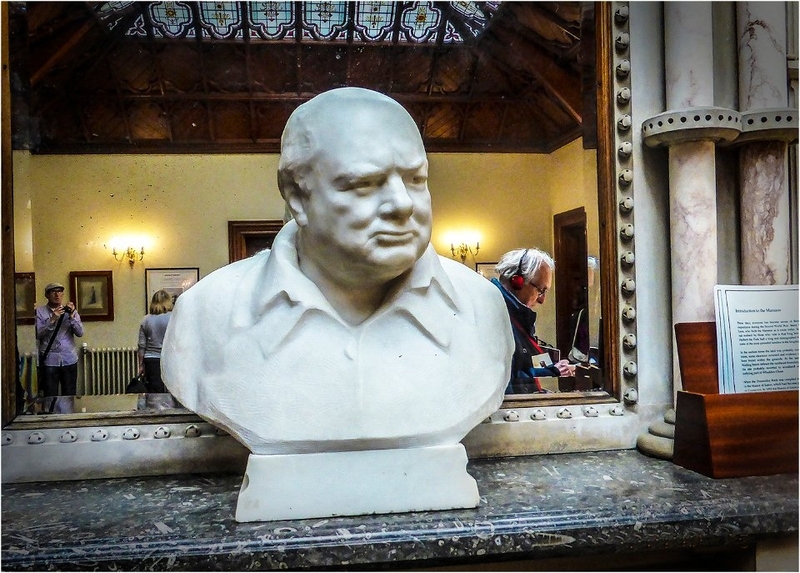 8 A Bust Of Sir Winston Churchill. 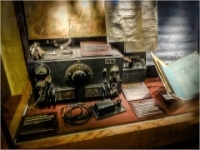 9 Radio Receiver And Headset. A typical radio set used to listen in to foreign coded messages. A morse key can be seen in the foreground. 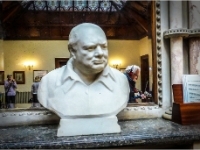 10 A Memorandum From Winston Churchill. 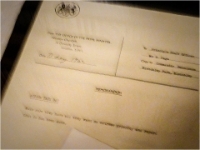 The memorandum is to Mr. G. Page, Principle Staff Officer. 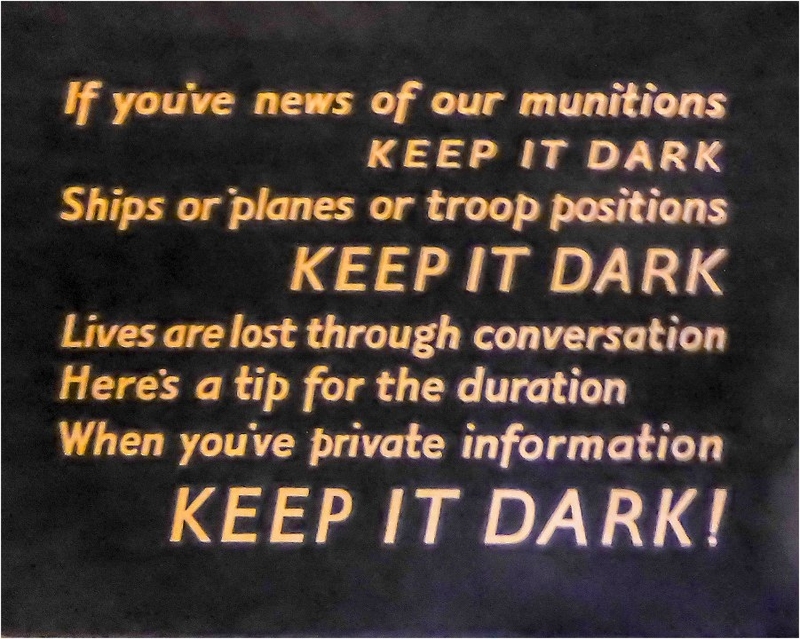 It is dated the 13th May 1942 and the message reads," ACTION THIS DAY: Make sure they have all they want on extreme priority and report to me that it has been done." 11 Alan Turing. 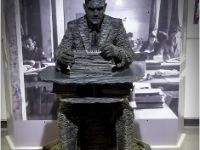 A statue of Alan Turing, mathematician, philosopher and cryptanalyst who played a pivotal role in breaking the Enigma codes. 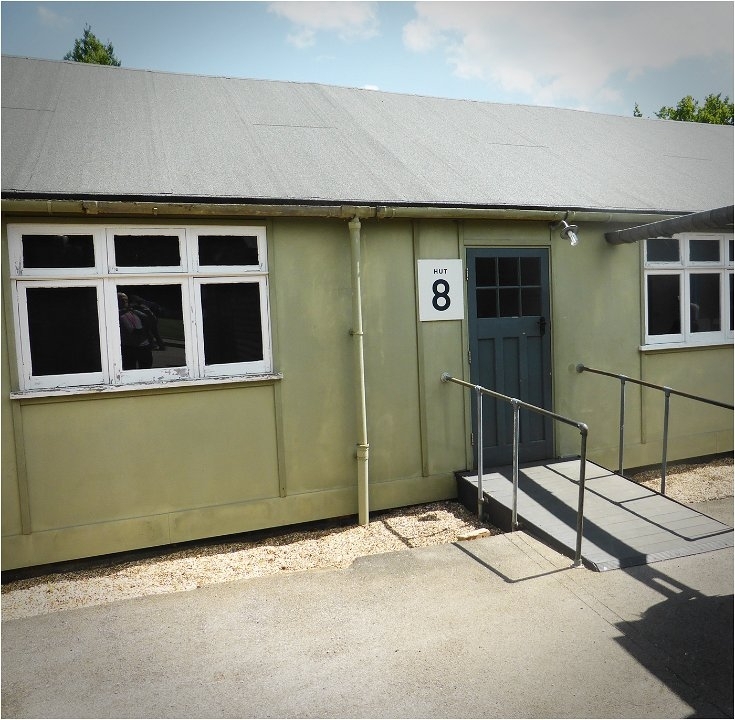 For a period he was in charge of Hut 8. 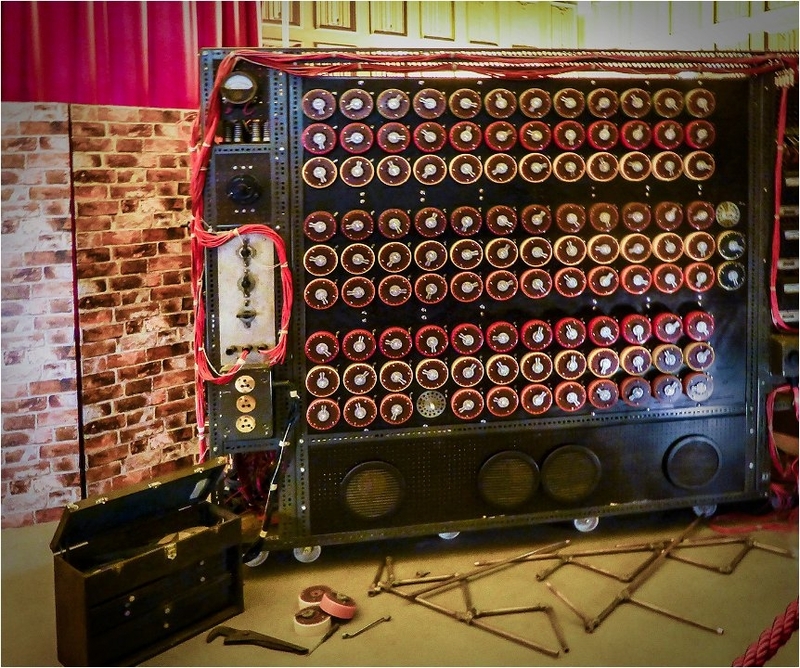 12 A Bombe Machine. 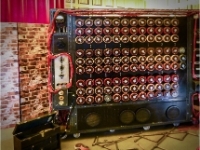 An electromechanical device for testing possible cyphers for the Enigma machine developed by Alan Turing and Gordon Welchman to speed up the daily search for the cipher keys used by the German Forces and Secret Service. 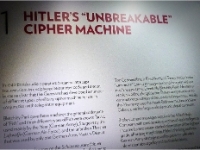 It was inspired by the 'Bomba' produced by the Polish Cipher Bureau. Each machine had 108 drums and each column was split up into 3 sets of 3 drums, representing the drums on the Enigma machine. The drums were driven through all 17,576 positions in around 12 minutes. 13 Inside A Bombe. This view shows the drive motor and the complex panels in position. 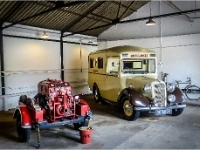 These machines were eventually mass-produced and stationed in villages around London. 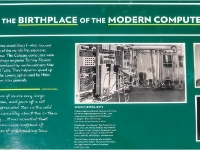 Some were even operated in the United States. 14 A Bombe Machine Under Construction. 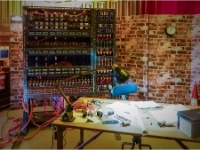 This is a back view of a Bombe machine under construction. 15 Colossus Max Newmann Tommy Flowers. 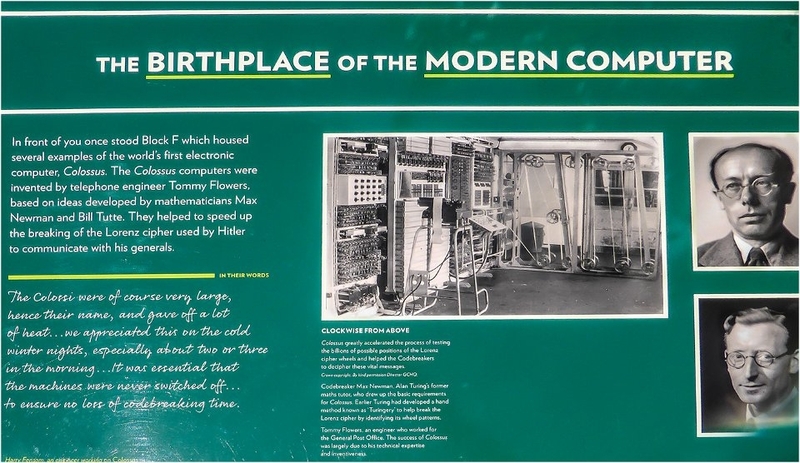 The plaque shows a photograph of Colossus, Max Newmann and Tommy Flowers. 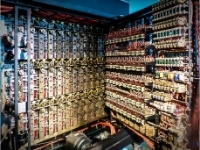 Dr. Max Newmann and his team designed the first digital computer which they christened 'Heath Robinson' but it was slow and unreliable and so Dr. Max Newmann contacted Tommy Flowers, a brilliant Post Office electronics engineer, who designed Colossus, which is now recognized as the world's first, practical, electronic digital processing machine (computer). 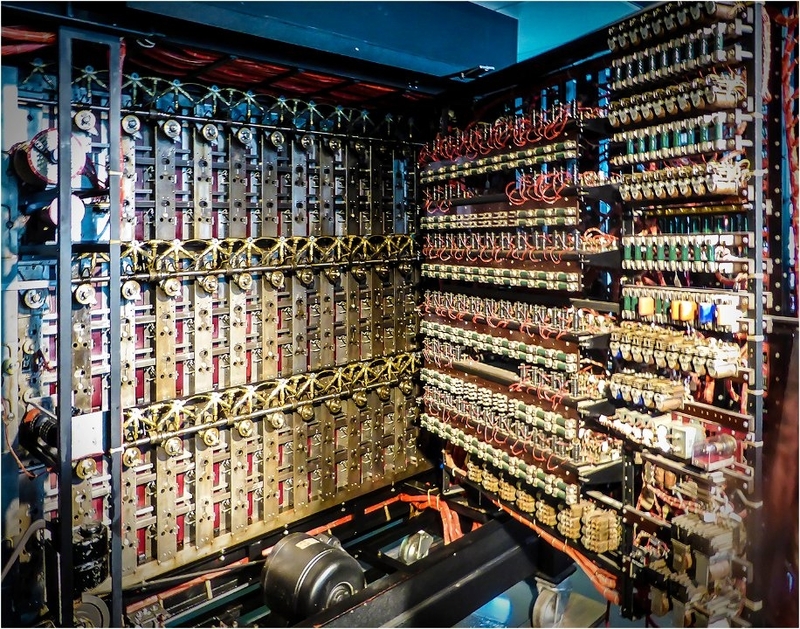 Colossus had 2,500 thermionic valves and the first Colossus machine arrived at Bletchley in January 1944. 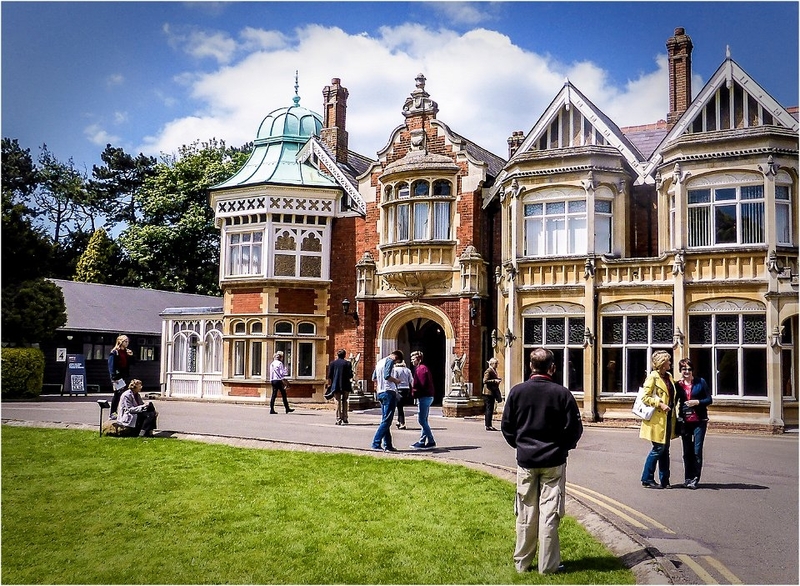 Eventually there were ten machines working at Bletchley Park. 16 1943 Norton WD16H Despatch Riders Bike. 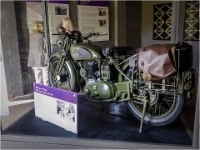 This a photograph of a 500cc Single Cylinder Side Valve Norton used by despatch riders. 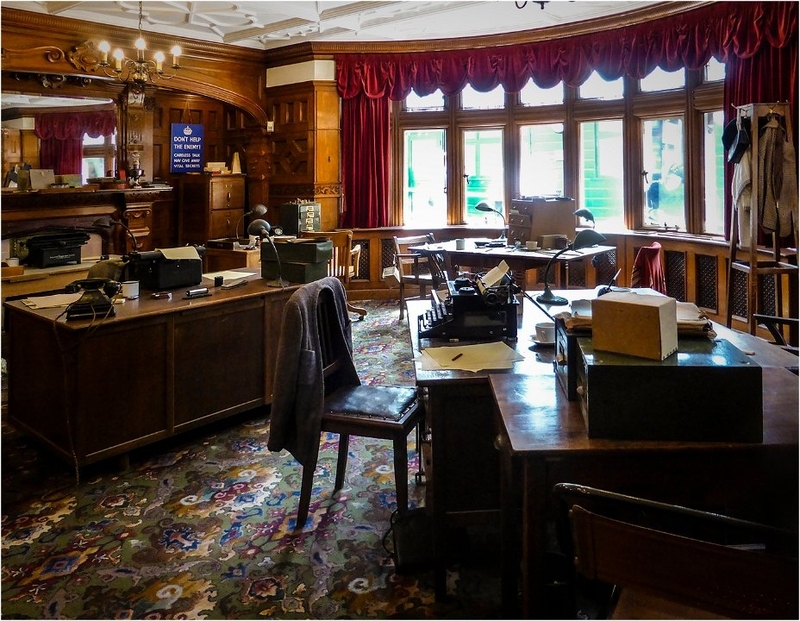 They carried messages between government departments, the military and Bletchley Park rather than using the telephone or radio communication, to minimise the risk of information getting into enemy hands. Despatch riders played a crucial role in the war effort. 17 Inside A Garage. 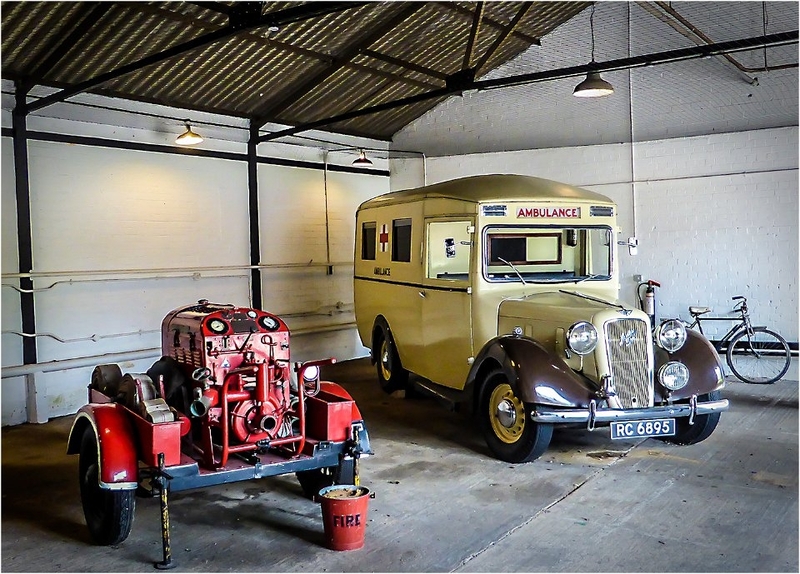 Fire fighting equipment and an ambulance of the period. 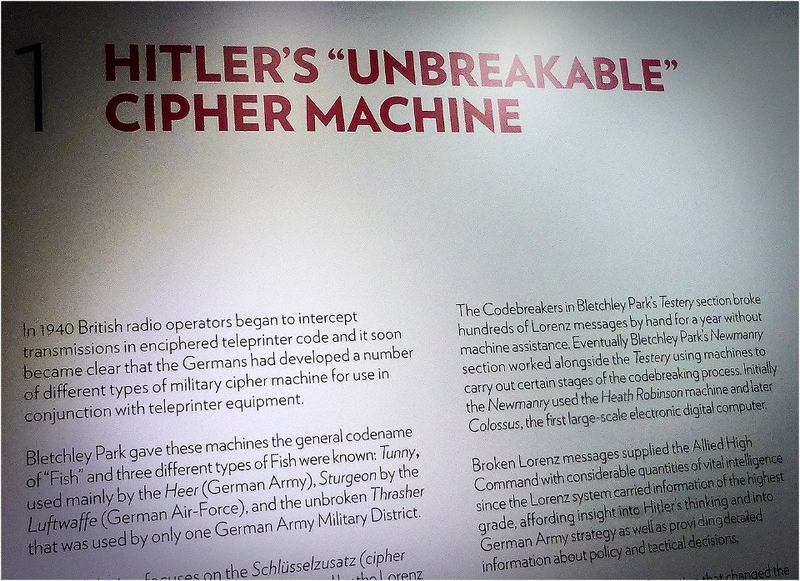 18 Hitlers unbreakable cypher machine. 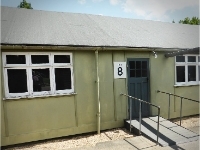 19 Hut 8. 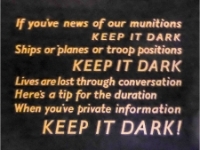 This hut was built in January 1940 for the decryption of raw material from the Navy. 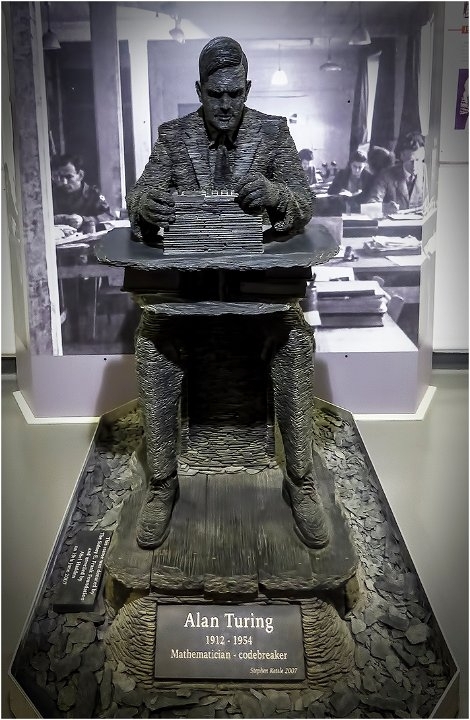 Alan Turing was initially the head of this hut and it became the driving force in the development of analytical machines to speed up the decryption process.